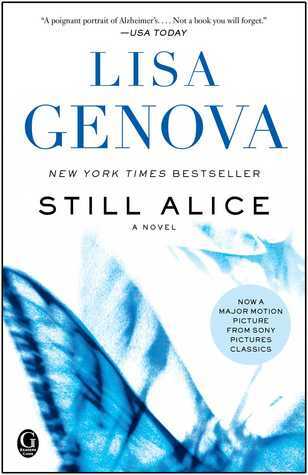 In the past four days, I’ve read the book Still Alice by Lisa Genova and then watched the movie version as well. Talk about intense! 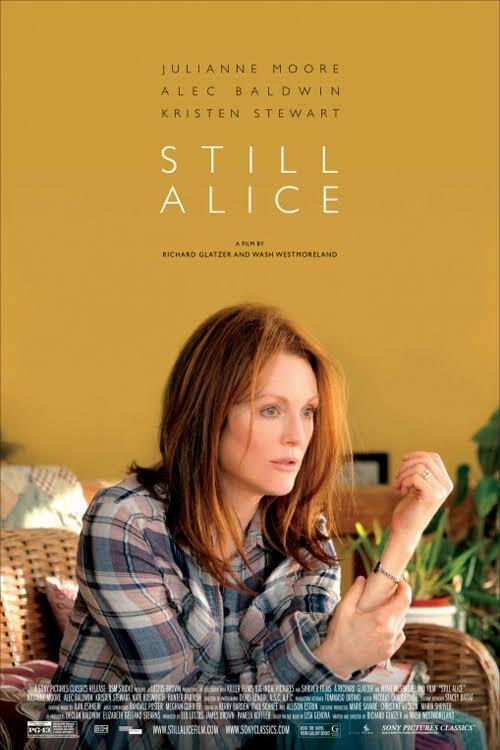 Still Alice (the book) is the profoundly moving story of Dr. Alice Howland, a world-renowned Harvard professor specializing in cognitive psychology. In her early fifties, Alice notices a few lapses, moments where a word she uses in her daily life is suddenly gone and beyond her reach. After getting lost while running a route she’s followed for years, Alice considers what might be wrong, at first associating memory issues with menopausal side effects. Finally, a neurologist delivers the awful news: Alice has early-onset Alzheimer’s disease. The progression can be delayed, perhaps, with medication, but cannot be prevented. Through Alice’s eyes, we feel the heartbreak as this incredibly talented, intellectual woman slowly loses bit and pieces of herself — losing the ability to teach, to work, to read, and even to recognize her own children. It’s astounding to get Alice’s perspective, because while she recognizes that she’s losing more and more, she often doesn’t know in the moment that anything is wrong or just how bad it’s become. And yet, she’s a remarkable woman who sees the beauty in life as well. Early on, she contemplates suicide, but realizes she still has a list of things she wants to do. She may no longer lecture or publish, but she can look forward to holding her first grandchild and seeing her children find their own paths to happiness. In the 2014 movie version, Julianne Moore plays Alice, and absolutely deserves her Best Actress Academy Award for this role. She capture Alice’s changes with such emotion and nuance — the disbelief, the helplessness, the striving to connect even as she faces a growing chasm between herself and the people around her. It’s beautifully acted, and beautifully told. I don’t always love movie adaptations of books I’ve read, and often find myself too busy being nit-picky to really just sit back and experience the movie. That didn’t happen here, even though only a day had gone by in between. The movie is faithful to the book, with only minor changes such as relocating from Boston to New York — nothing that substantially changes the main idea or tone of the story. The supporting cast is terrific as well, especially Alec Baldwin as Alice’s husband — loving, angry, hurt — and Kristen Stewart as the youngest daughter, Lydia. The relationship between Lydia and Alice is very well done in the movie. They start with conflict between them: Alice wants Lydia to go to college, and Lydia wants to pursue her acting career. Neither can help hurting the other, but as Alice’s disease progresses, she loses her intense focus on her plans for Lydia and becomes more open to appreciating her in the now, and Lydia finds a patience and devotion for her mother that let her get past the earlier tension and mistrust. It’s actually quite lovely to watch this pair — I totally believed them as mother and daughter. No movie can capture everything from a book, and by necessity, the movie presents us with an external view of Alice’s ordeal, rather than allowing us to experience it alongside her as we do in the book. Even so, the movie is beautiful and moving, and I recommend it highly. Lisa Genova is a fiction writer with a Ph.D. in Neuroscience. I’ve now read three of her four novels, and these three each show, in different ways, the human, emotional impact of a severe, life-altering medical condition. She manages to combine absolutely fascinating science with family dramas that feel true to life. Still Alice is a tough book to read, in terms of emotional impact, but well worth it… and I feel the same about the movie. Beyond this book, I also recommend Left Neglected, about a woman with an incredible, intriguing brain injury that changes her whole life, and Inside the O’Briens (review), one of my top picks for 2015, about a family dealing with Huntington’s disease. I both read and watched Still Alice this year also – a couple of months ago now – and I feel like you’ve utterly captured my thoughts on both in this post of yours. Lisa Genova is definitely one of my new favourite authors. I’ve read Left Neglected since Still Alice, and I thoroughly enjoyed it, but it didn’t match up to Still Alice for me – I think none of the books will hold the same feelings as Still Alice, but I’m happily working through them. Thank you so much! Lisa Genova is so talented, and I feel like her books just stay with me long after I put them down. I think you’ll really enjoy Inside the O’Briens too! Thank you! It really is a powerful book, but yes, very upsetting too. I was afraid that it would be too much, which maybe is why it took me a couple of years to read it after picking up a copy, but I’m glad I finally did. Even though it’s terribly sad, there’s a lot of positive too in the relationships and love between Alice and her family. I’m putting this on my list – sounds like a book I would want to read. Great review. Thank you! It’s a heartbreaking read, but so worthwhile.